26,000? Think about that for a moment. Details of ships where detainees have been held and sites allegedly being used in countries across the world have been compiled as the debate over detention without trial intensifies on both sides of the Atlantic. 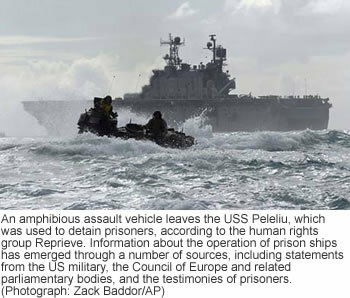 The US government was yesterday urged to list the names and whereabouts of all those detained.Information about the operation of prison ships has emerged through a number of sources, including statements from the US military, the Council of Europe and related parliamentary bodies, and the testimonies of prisoners. This is your government cracked on power and greed and brutality. 26,000 prisoners on ghost ships. How many more?